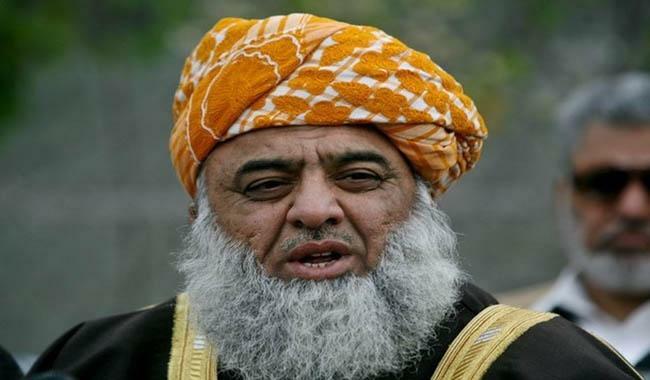 Jamiat Ulema-e-Islam-Fazl (JUI-F) chief Maulana Fazlur Rehman has expressed hope that Pakistan People’s Party (PPP) Co-chairman Asif Ali Zardari would withdraw Aitzaz Ahsan as PPP’s candidate for president in his favour as opposition’s joint candidate. Addressing a press conference on Monday, Fazl said that it will be their effort to take Zardari in confidence and convince him to reconsider his decision so that a joint candidate could contest. Fazl lamented that PPP’s refusal to vote for Shehbaz in the prime minister’s elections resulted in Imran Khan becoming the prime minister. He also tried to downplay that the opposition alliance was facing discord saying that the act of dividing up the opposition is not popular in the public. The JUI-F chief also said that he and the Pakistan Muslim League-Nawaz (PML-N) both wanted the opposition’s candidate for the prime minister to be from PPP, adding that the PPP said that the PM candidate should be from the PML-N.
“When a consensus was reached, then the PPP decided not to vote, which dispersed the opposition, and turned our hope of going into the parliament and turning the tables into disappointment and despair,” he said. “We would not want to give the same disappoint to our members once again,” he said, adding that a joint position on this issue should be presented. On the other hand, Aitzaz Ahsan said that the only objection against his candidature for the post of president was that his party did not consult other opposition parties before nominating him, a claim which he refuted. Speaking to reporters on Monday, he said that his name was agreed upon at an internal party meeting, but before it could be proposed to the alliance, the nomination started doing rounds on media as PPP’s unilateral choice. He said the demand put forward by PML-N leader Pervez Rashid that he [Aitzaz Ahsan] should apologise to Nawaz Sharif for his inappropriate remarks regarding the ailment of Nawaz’s wife in exchange for the PML-N’s possible support was Rashid’s personal opinion and not the PML-N’s position. Aitzaz Ahsan said that he was surprised to hear such a demand coming from Rashid, whom he respects as a progressive intellectual.